Poster is held in place between (2) pieces of acrylic. 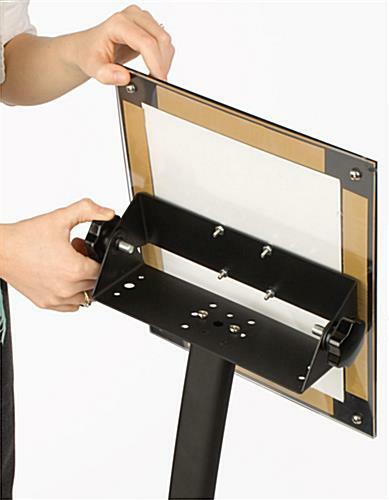 Adjustable bracket allows you to tilt acrylic frame for better viewing. Graphic holder fits an 8-1/2" x 11" image. 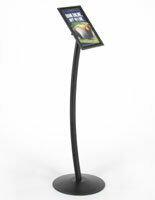 These graphic holders feature an acrylic frame that can hold an 8-1/2" x 11" print. 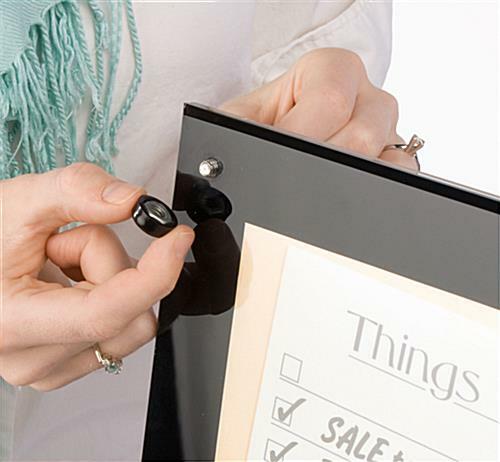 The poster is held between two pieces of acrylic secured by (4) screws with decorative caps. To insert signage; unscrew the (2) top caps and slide the sign in between the panels, replacing the caps to finish. 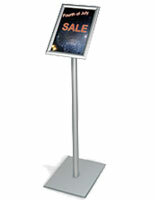 These sign displays, graphic holders can be displayed either horizontally or vertically. 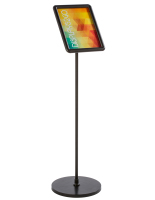 This versatile poster stand gives users a lot of freedom to create signage in either portrait or landscape orientation. 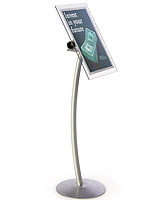 Lobby stands, poster displays, and other graphic holders have an adjustable bracket that allows users to angle the frame however desired. Simply turn the dial located behind the frame to make adjustments. 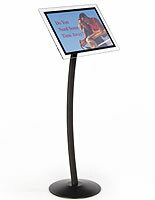 These sign stands are perfect graphic holders for use in restaurants, retail stores, and business or hotel lobbies. 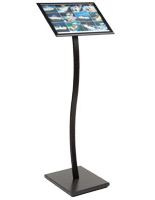 The black metal finish stands out in any type of business setting. 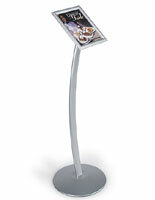 These poster stands, graphic holders have a curved pole made of aluminum to hold up the acrylic frame. Durable and strong, the aluminum allows the sign stand to be used in heavily trafficked locations without a problem. These graphic holders are shipped unassembled to keep shipping costs down. One person can easily set up this sign stand in a matter of minutes. These poster displays, graphic holders have a black border around the frame, presenting it in a beautiful manner. 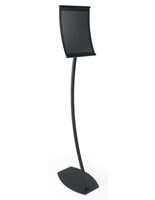 The metal base is weighted to keep the unit stable, even when bumped or tipped. Graphic holders, like these sign displays and retail stands, are a sure way to give your establishment an upscale look for a low price.